Concerns are growing over the weakening vitality of the Korean economy as facility investment continues to decrease, with consumer sentiment and business confidence sluggish. Government data released last week showed facility investment fell 0.6 percent on-month in July, marking a decline for five consecutive months. It was the longest straight decline since the foreign exchange crisis, when investment fell for 10 straight months from September 1997. Analysts at the state statistics office attributed the slump in facility investment partly to the completion of major chipmakers’ projects to expand production lines. Earlier last week, the Bank of Korea released figures showing both business and consumer sentiment worsening. The business sentiment index fell from 75 in July to 74 in August, the lowest level in 18 months. A reading below 100 means companies with negative views about future business prospects outnumber those with a positive outlook. Domestically focused small and midsized firms were more pessimistic than large export-oriented companies as they struggled to cope with sluggish domestic demand and rising labor costs. The consumer sentiment index dropped to a 17-month low of 99.2 in August, down 1.8 points from the previous month. A number below 100 indicates there are more consumers with a bleak view of the economy than those who see it positively. Consumer sentiment was dampened by a sluggish job market and the soaring prices of everyday goods, according to the BOK statement. Economists say the continual decrease in facility investment coupled with deteriorating business and consumer sentiment should be taken as serious signs that the economy is being dragged into a lengthy recession. They call on President Moon Jae-in’s administration to reconsider its income-led growth policy, driven by a set of labor-friendly measures, which are under growing criticism for weakening corporate activity and reducing jobs and earnings for low-income people. 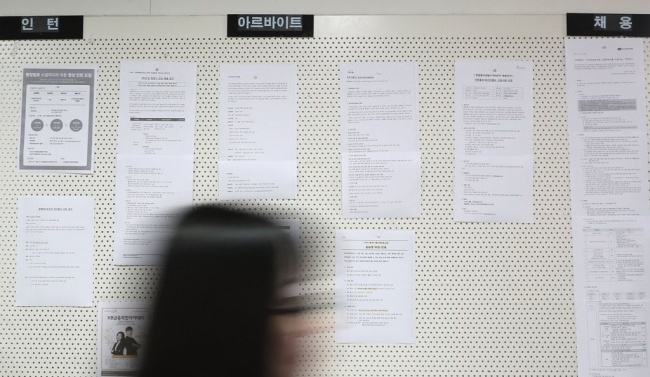 “The government’s inflexible pro-labor policy will ultimately worsen the business environment,” said Cho Joon-mo, an economics professor at Sungkyunkwan University. He added that policy changes were needed to encourage companies to increase investment and employment. Reflecting growing woes faced by local businesses, the number of small and midsized firms and venture companies put on sale jumped 44 percent on-year to 360 in the first half of this year, according to the Korea M&A Exchange. An official with the institution said the number was expected to exceed 700 by the end of the year, as compared with 538 last year. The problem is that it is hard to find purchasers amid worsening business conditions. The Moon administration remains reluctant to concede that the economy is entering a recession, and has vowed to carry forward its unpopular income-led growth policy. This stance is criticized by economists for ignoring the country’s economic reality. What particularly worries them is that a set of indicators used to forecast economic conditions after six months dropped below 100 in July for the first time in nearly two years. Data released last week by Statistics Korea showed manufacturing production and retail sales edged up 0.1 percent and 0.5 percent on-month, respectively, in July. But economists say the slight increases are likely to turn negative with the economy taking a downturn. A heavy reliance on the booming semiconductor sector veils the weakening competitiveness of other major manufacturing industries in the country. Economists urge the Moon administration to accelerate deregulation to help foster new industries that could serve as future growth engines. Despite its repeated pledges to push for regulatory reforms, the Moon government has done little to overcome objections from many ruling party lawmakers as well as various interest groups. Consumers are tightening their purse strings due to worries over future economic uncertainties in addition to worsening employment conditions and rising prices, said Lee Yoon-soo, an economics professor at Sogang University. “The government has failed to convince the people that the economy will improve,” he said. The deteriorating economic situation led Kim Kwang-doo, the deputy head of a presidential economic advisory panel, to ask Moon last week to depart from his income-led growth drive to focus on creating more jobs by helping boost corporate activity. It has yet to be seen whether and to what extent the president will accept suggestions from Kim, who helped carve out Moon’s economic pledges during last year’s presidential election campaign but later became a critic of labor-friendly steps taken by the administration. Economists note forging a more favorable environment for corporate investment would help curb soaring housing prices by funneling excess liquidity from the overheated property market into the industrial sector. “Money would be channeled into industrial investments when corporate conditions are improved by lifting strict regulations and easing anti-business sentiment,” said Cho Dong-geun, an economics professor at Myongji University.